We invite you to spend time with our talented staff in a laid back environment! Only a Stranger but once and always leave as Bella as can be. Why not? You’re worth it! Check us out on Facebook for more information, events, promotions and much more. Welcome to Ciao Bella Hair Studio: Buffalo NY’s Number One Hair Salon! When you are looking for hair and beauty services in Buffalo, NY, look no further than Ciao Bella Hair Studio. We are located just minutes from downtown Buffalo and offer a number of hair and beauty services including haircuts, styling, hair removal, facials, teeth whitening and so much more! A combination of competitive pricing, experience and attention to detail are just a few of the reasons people choose Ciao Bella Hair Studio. From weddings to proms and other special events, there are a countless number of occasions which might require you to seek out a professional hair and beauty salon. No matter the occasion, we are here for you! Maybe you are just looking for a nice and relaxing day out of the house with some pampering involved. Whether or not you have a reason or a special occasion, Ciao Bella Hair Studio welcomes you! Thank you for stopping by and checking out Ciao Bella Hair Studio, your number one hair salon serving Buffalo, NY, Kenmore, NY and surrounding areas. If you have questions about any of our beauty services, feel free to give us a call at 716-873-3993. For your convenience, you can also reach us by email at info@bellahairbuffalo.com. Feel free to continue browsing through our site for more information on our services. Check back frequently as we are always adding new services and updating information! 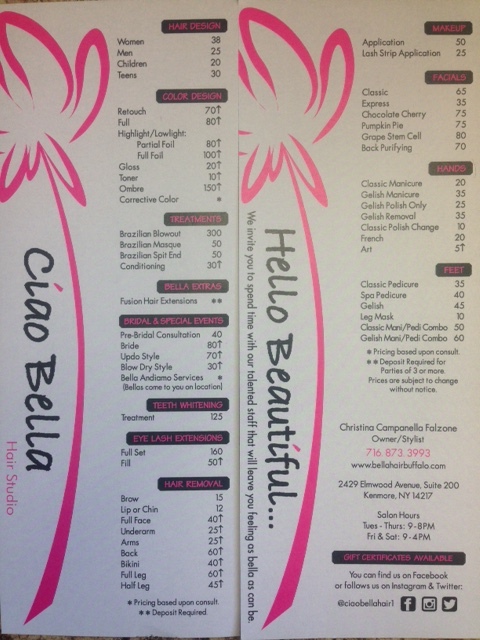 Ciao Bella is the premiere Buffalo NY hair salon. servicing more than just Kenmore NY, our hair salon is fully equipped for all of your needs. If you are looking for a hair salon in Tonawanda NY, then look no further than Ciao Bella! Our hair salon doubles as a nail salon in Buffalo NY. Our Kenmore NY nail salon service is unmatched in the area. If you are looking for a nail salon near Tonawanda NY then stop in or give us a call!